Medtronic has started the European launch of its Total across crossing catheter, a tool for improving blood flow through narrowed or occluded lower-extremity arteries, including those in the especially challenging below-the-knee (BTK) vessel bed. Medtronic recently obtained CE Mark approval for the Total across crossing catheter, which is designed to guide and support a guidewire, including the crossing of a target lesion, during the access of peripheral arteries with obstructive disease and to allow for wire exchanges. The Total across crossing catheter also provides a conduit for the infusion of saline solutions or diagnostic contrast agents. Spiral cut stainless steel hypotube construction of the device affords exceptional pushability and unparalleled catheter visualization, while the tapered tip allows the catheter to cross lesions smaller than the device profile. The device features a 2-French tapered tip which provides seamless catheter-to-guidewire transition facilitating crossing of challenging lesions. The spiral cut stainless steel hypotube construction and the 2-French tip crossing profile address the specific challenges often encountered in patients with critical limb ischemia caused by BTK lesions. Medtronic senior vice president and Endovascular Therapies business president Tony Semedo noted the Total across crossing catheter expands the company’s portfolio of medical devices for the interventional treatment of peripheral artery disease. "It’s a prime example of our focus on developing lesion-specific solutions and our ongoing commitment to addressing BTK lesions specifically. We are excited to be introducing this new device in Europe and look forward to bringing it to the United States in the near future," Semedo added. Medtronic has also submitted an application with the US Food and Drug Administration (FDA) for 510(k) approval. The FDA has not yet approved the Total catheter or approved any of the IN.PACT drug-eluting balloons. The device is not approved for commercial use in the US. 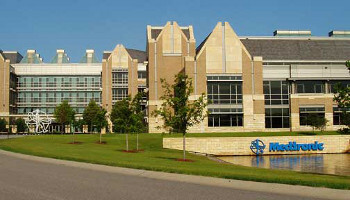 Image: Medtronic world headquarters in Minneapolis. Photo: Courtesy of Medtronic Inc.